After that, he delivered a long, rambling, off-script fantasy about women bound by duct tape being transported over the border, probably designed to create a dramatic narrative distraction from the deflating reality that he had won nothing more than a promise by Congress to listen to his staffers’ budget requests. Nobody has ever gained anything from a government shutdown. Trump nonetheless decided to try, egged on by a sycophantic right-wing media that pushed him into a tactic he could never win, and then denied the obvious. The shutdown “is highly unlikely to hurt either President Trump or the Republican Party,” argued Henry Olsen in December. “There’s no reason he shouldn’t dig in for the holiday season and wait for the Democrats to offer a compromise he can live with.” Amazingly, Olsen’s column did not contemplate what would happen if Democrats refused to offer up a concession and simply waited for the inevitable backlash to force Trump to relent. That, uh, did not happen. Instead, Trump’s approval rating sank below the 40% level in poll after poll, and he had to surrender before the economic chaos threw the economy into recession. The mystery of Trump’s bad-but-not-bad-enough approval ratings has spooked liberals ever since his surprising election victory. 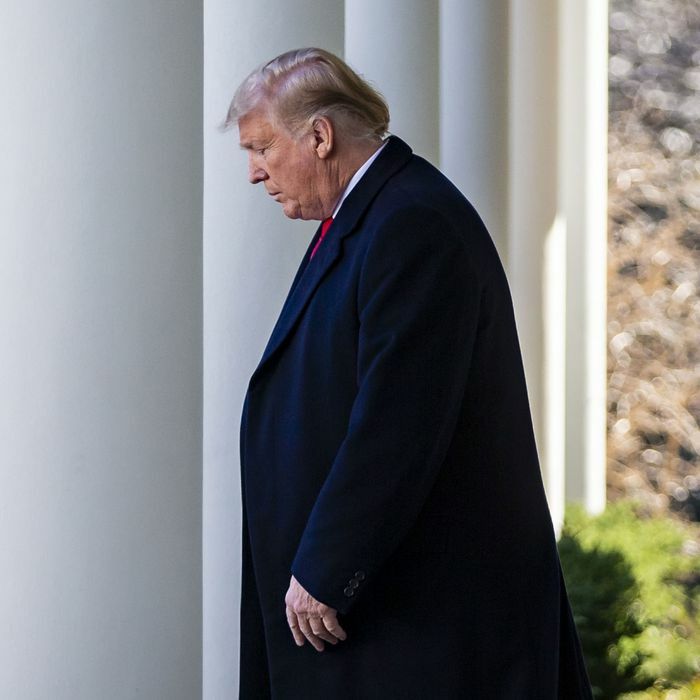 The shutdown debacle provides some hint as to what might be in store for his public standing if the economic recovery he inherited comes to an end. He has been held up by polarization, a party-controlled media apparatus, and kept aloft by the peace and prosperity he was bequeathed. In every other respect, Trump is absolutely horrible at politics. His policies are unpopular. He can’t make deals with Congress because he understands too little of the policy substance and can’t be bothered to learn. He surrounds himself with unqualified staffers and listens to the worst advice presented to him. The shutdown was a self-inflicted wound whose outcome was utterly predictable.